"...Finally I discovered the field of publishing, and I knew it was something I could really enjoy. Helping deserving authors get their share of the spotlight, all the while working with stories and people that I loved? Sounds ideal to me." Becca Duggan is a Creative Writing Major at Indiana University. The first thing you should know about me is that I love to ramble. Getting caught up in what I’m saying is not just habit but is expected of me. I am an incredibly detail-oriented person and as such my stories about grand ideas temporarily focus on the miniscule. For example, I often tell people about the time that I had to run around my bustling hometown in my pajamas, in broad daylight, in order to find my runaway dog. I take the time to mention that I was wearing an oversized shirt with a kitten hanging upside-down on it, as well as long, blue pajamas pants with snowflakes on them (note: it was the middle of June, nary a snowflake in sight, when I was sporting these pants during my unceremonious fashion walk down some of the town’s most popular streets). 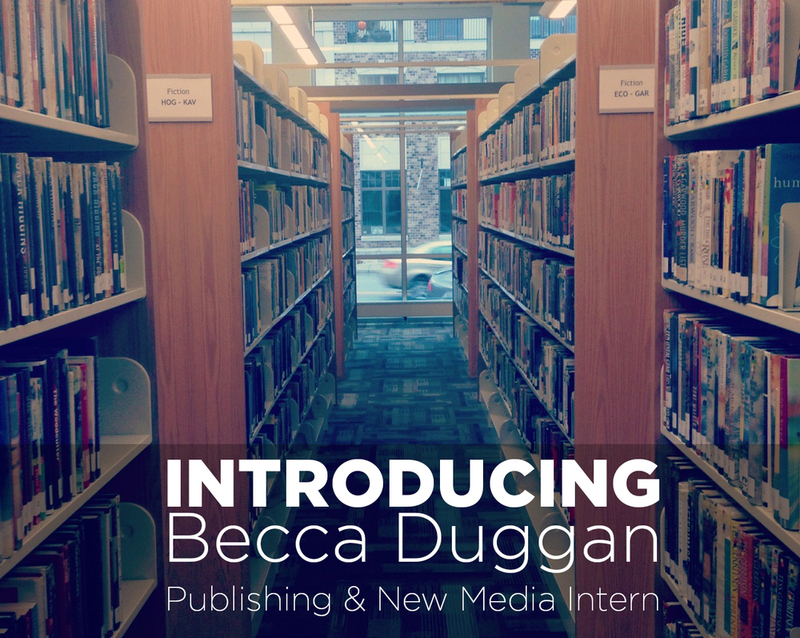 A few details to know about me- my name is Becca Duggan, and I’m a senior at Indiana University. Since before I could write, I knew that being a writer of stories was my ultimate goal. I couldn’t believe that adults got paid- even encouraged- to make things up. It seemed like the perfect career path and I pursued it relentlessly. Growing up in the moderately-sized town of Crown Point helped me in unexpected ways on my journey to be involved in books. The town was small enough for my imagination to grow beyond it, yet big enough to hold some truly unique characters to inspire me. My parents always encouraged me to pursue what I loved- as long as I had a back-up plan if (or when) my foray into writing left me penniless. That can be parents for you- they believe in you up to a point, but then they start to get nervous. As I grew older, the realm of writing and reading held so many areas for me to love and delve into. I loved the idea of writing for a television show, of writing catchy slogans or phrases for commercials, of writing screenplays, of proofreading already-completed works, etc. etc.. Finally I discovered the field of publishing, and I knew it was something I could really enjoy. Helping deserving authors get their share of the spotlight, all the while working with stories and people that I loved? Sounds ideal to me. "...These people are genuinely invested in getting your words- the words that came to you at 3 AM when you were trying to go to sleep but that one sentence kept nagging at you until you rolled out of bed to scribble it down... - out there to the public"
So, as you can see, rambling is commonplace for me. The beauty of a story can be found in its details, I figure. I’m still fresh on the scene, so naturally I am still young and naïve about the whole process, but there is a palpable excitement and passion that is undeniable in this business. These people are genuinely invested in getting your words- the words that came to you at 3 AM when you were trying to go to sleep but that one sentence kept nagging at you until you rolled out of bed to scribble it down, the words that you spent countless hours and cups of coffee trying to perfect, the words that seemed endless and hopeless but eventually mustered themselves into exactly what you needed- out there to the public. As someone who has worked at many a retail store, restaurant, and telemarketing business, it is downright awe-inspiring to be in a field where passion is the key motivator. Passion for people, passion for reading, passion for words. In a field where rambling is welcomed, even- within good reason, of course.